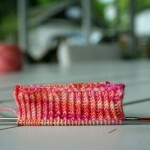 I learned a few important lessons while knitting my first afterthought heel. I took some notes so I wouldn’t forget and I thought they might be helpful for you if you’re considering trying an afterthought heel too. Fine-tuning the fit is easier when knitting the sock top-down. You can easily add a few more rounds on the leg but you can’t do that on the foot. The Crystal Socklet heel is awesome! Its shape is much more anatomically-correct with its 4 point spiral decreases and changing rate of the decreases. Thank you Rycrafty for the fabulous recommendation. 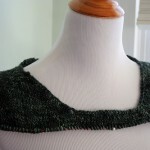 If possible, don’t put the waste yarn in a dark stripe. 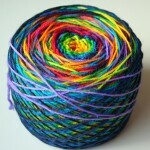 It was a miracle that I didn’t drop any stitches when picking out the waste yarn. Approximating leg length is hard because you can’t try the sock on until you work the heel. I estimated the leg with another handknit sock but it’s a bit shorter than I’d like – not unwearably short but it could definitely be longer. Next pair. Working with very long color repeats – in my case 15 colors of stripes – creates more waste if you want to match up the heels. Just something to keep in mind if you’re neurotic like I am. With all that I learned, I still think my first afterthought heel came out great. The yarn is doing all the work. How can you not love 15 Colour Rainbow? I’m glad to be finding inspiration with self-striping yarns because you may remember all the self-striping yarn I have in my stash. And no, your eyes don’t deceive you – I forgot to include 15 Colour Rainbow in the pic. Now to CO for sock #2. I’m halfway through my first pair for the Rock the Socks KAL. Yeah! socks, Tips & Techniques, WIPs - 2014 15 colour rainbow, afterthought heel. permalink. Thank you for sharing these great lessons! sure thing! some i read about and others i learned as i was knitting them so i thought i’d put them all down in one place here. Thanks for sharing the tips with us. I am in love with these bright happy socks! 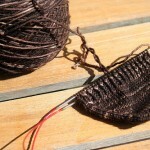 I think the main thing that has kept me from an afterthought heel is that I’d have to weave in two more ends! Of course I’m also willing to rip a sock multiple times to make the heel striped “just perfect”. I was wondering, how does the heel fit you? it fits *really* well! i had been hesitant to try an afterthought because i thought it would fit like a short row heel but the Crystal heel fits beautifully! 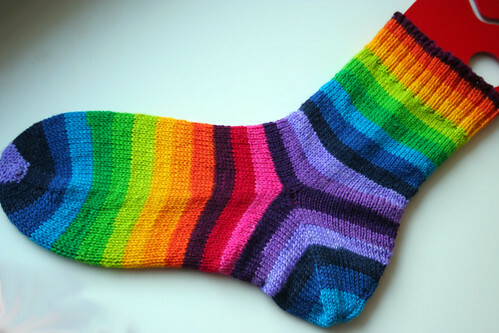 That is one beautiful sock! Thanks for such excellent notes. 2014 is the year that I finally try an after-thought heel so I’ll be returning to your blog post soon. Pretty snazzy. 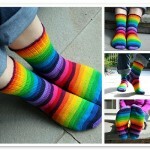 Those socks would brighten anyone’s day. Love.